An Über ride from my house in Goleta to the Santa Barbara Airport, a short hop from there to the confusing, labyrinthine mess they call LAX, a trans-Pacific flight spent watching movies and appreciating the effects of Unisom tablets, a short hop between Australia and what’s left of Zealandia, and we deployed, with the help of the United States Airforce, to the driest, windiest, coldest, most remote, and most desolate continent, spending a few days in the relative comfort of McMurdo Station before the helicopters took us out into the field and essentially out of reach of civilization. 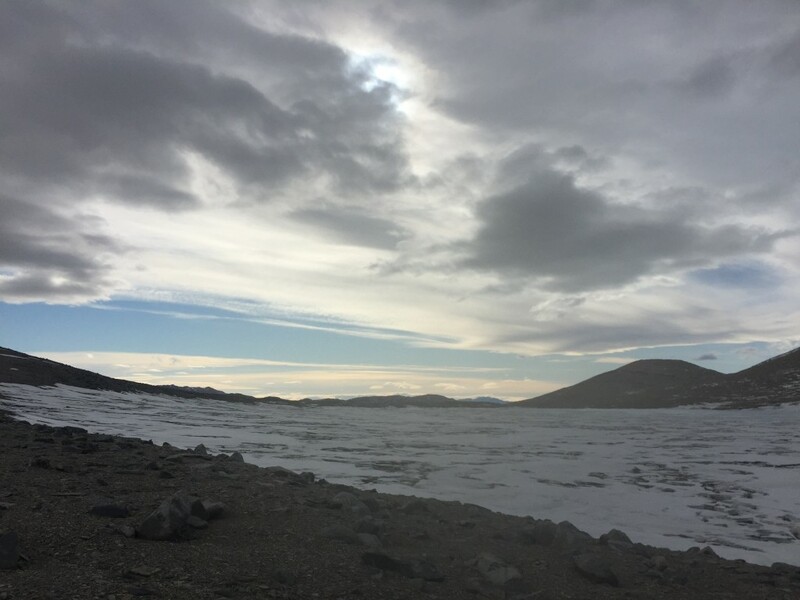 A short car ride, booked via Demian’s cell phone, ended with me being in, arguably, the most remote and untraveled place on Earth. Five weeks of sampling later, there was a second journey: another helicopter trip, four more flights, and one last Über ride and I’d wandered back into my house with a lot of equipment in need of repair, quite a few pictures of dike exposures and seal mummies on my computer, and the strange thought that my memories of fieldwork in the Dry Valleys had indeed become “memories” and that I was back in the “real world.” After a bit of time spent at my parents’ house relaxing and having some lovey time with a certain dog, it’s time to get to work on the several tons of rocks we now have. On we go. As a parting note: the pictures I’ve taken that are any good (I hope) and that I’d think would be of interest to non-geologists are now on Rob’s Facebook page, where he’s set up an album that showcases our attempts at photography. Now that bandwidth is no longer in such short supply, and now that it no longer costs John $2 a minute to use the internet, it’s much, much, much easier to put these pictures out, I have to say! I’ve also put my pictures into a Photobucket album, for those who don’t have Facebook, since, as my dad will tell you, Mark Zuckerburg’s invention isn’t entirely ubiquitous just yet. I’d like to make some acknowledgements. 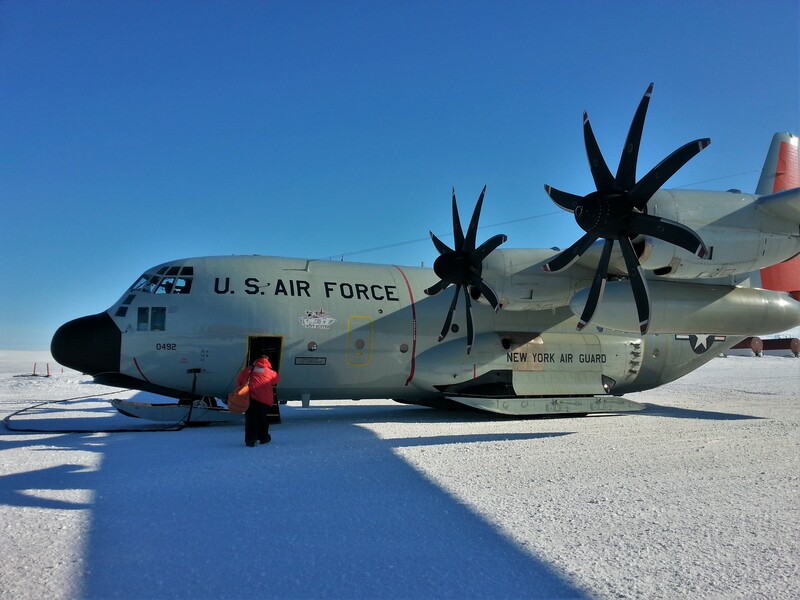 Firstly, I’d like to thank the NSF for funding this project and giving me the privilege of visiting Antarctica in the first place. 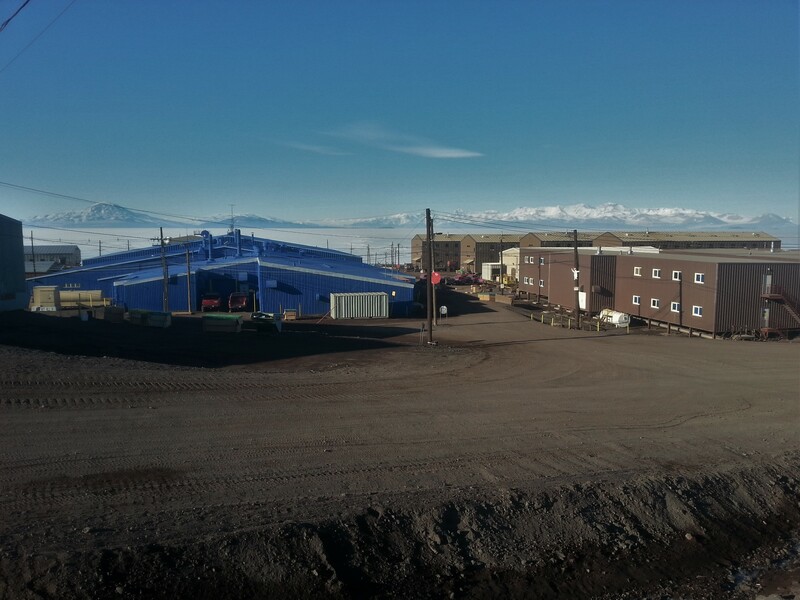 Thanks to as many of the USAP personnel and McMurdo Staff as I can remember, and if I’ve forgotten anybody (I sincerely hope not) then consider this thanks to you, as well. In no particular order: Bija Sass and the other Berg Field Center Staff for keeping us fed and well-equipped; Jen Blum, our point of contact at McMurdo, for keeping us up to date; The Crary Science Center Staff for processing and storing the rocks we sent back; the Science Cargo workers for helping us palletize our samples; Lindsay Steinbauer and all of the USAP and Antarctica New Zealand helicopter pilots and technicians for keeping us mobile and making our day trips possible; the US Airforce pilots and staff who brought us to and from Antarctica; Genevieve Bachman and the other communications staff for helping us stay in contact with each other, MacOps, and the outside world; MacOps, for keeping an eye on us when we had, basically, vanished off the face of the earth; the Center for Polar Medical Operations doctors; the McMurdo kitchen staff for keeping us fed and content during our pre- and post-season days; last but not least, anybody and everybody who made surprise deliveries of pizza during helicopter visits, since the mere fact that it happened is something of a small miracle. 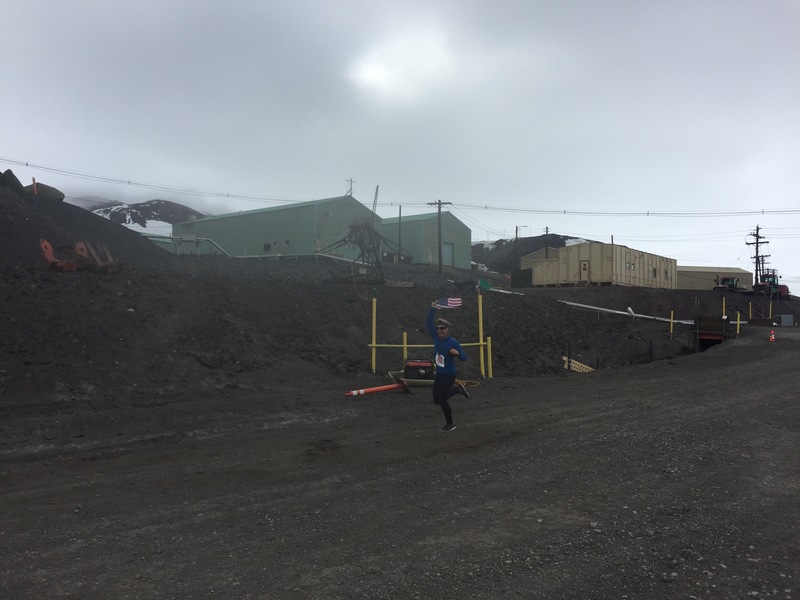 I’d also like to thank Anna Cottle for keeping this blog up-and-running, my mom for outdoing herself by sending care packages to Antarctica, and to everybody who sent me mail; it was appreciated. Rob and Demian for being great field partners and for helping me out with both geology and mountaineering-related advice throughout the season. And lastly, I’d like to thank John Cottle for the experience, guidance, and know-how, for being patient with my endless questions, and for making this field season possible in the first place. And…I suppose that’s it. Here’s to a good end to 2015 and a good 2016 for you all. Thanks for reading. Me at Rucker Ridge during our penultimate day trip (photo courtesy of Demian). A final shot of Hidden Lake, our last campsite. 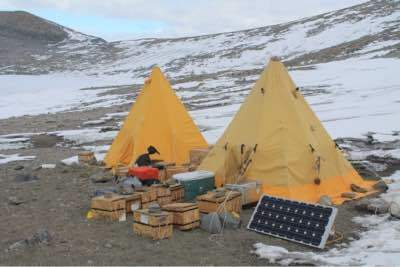 Key to the whole operation are two Bright yellow Polar Scott tents – p retty much the same design as that used by the original Antarctic explorers. One contains our kitchen / dining room in which we melt snow/ice for drinking water, cook (all on a propane stove) and eat. Cleaning the dishes usually involves a quick wipe with a paper towel. 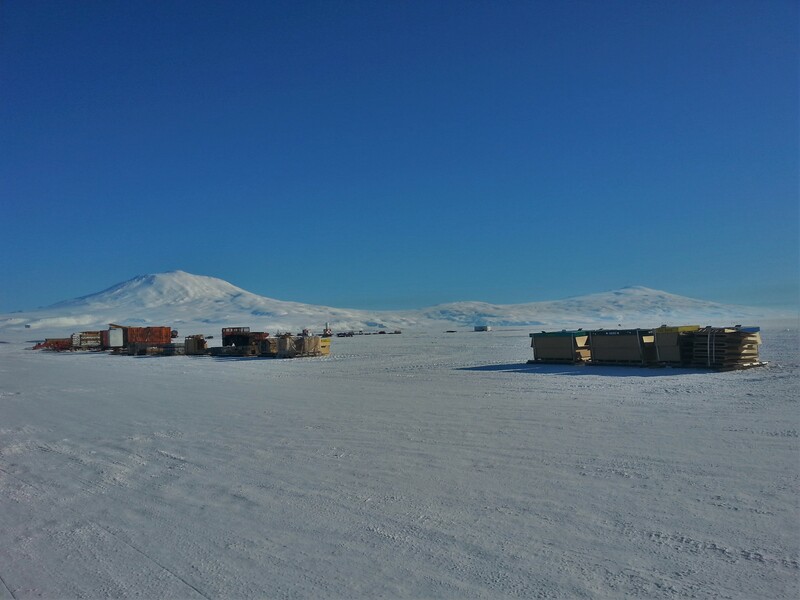 We store all of our food (about 200lbs worth, or two weeks supply) outside the tent in coolers and wooden boxes. 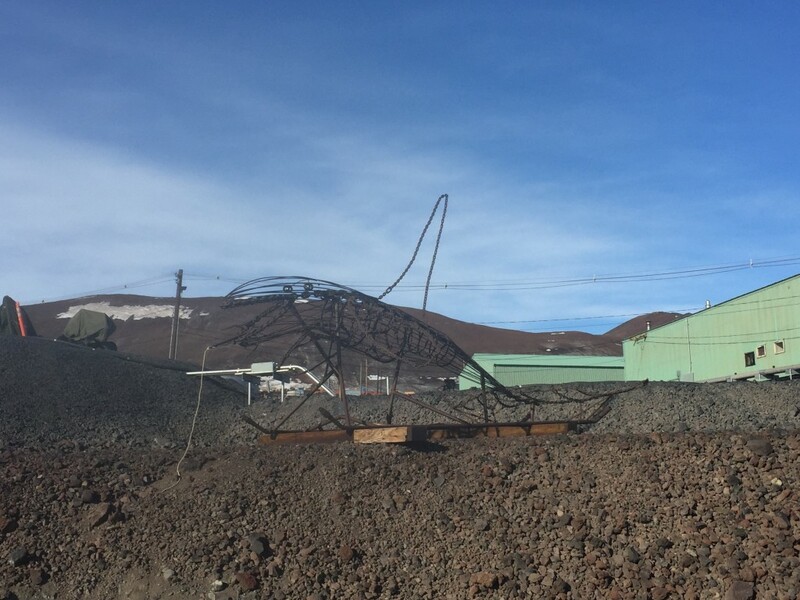 We separate our trash into food waste, recyclables and non-recyclables, and these all get returned to McMurdo station and added to the waste stream that is removed from the continent. 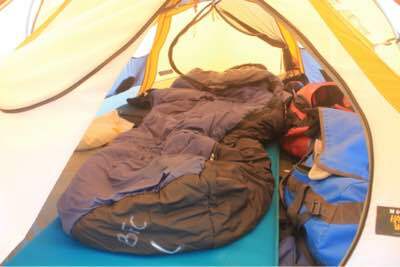 We each sleep in our own mountain tent (a Mountain Hardwear Trango 2). The tents are just large enough for us to sit up in and fit all of our personal gear, our giant -20F rated sleeping bags, a foam sleeping pad and a big thermarest. Because they are small they tend to warm up quickly and trap a lot of heat from the sun, so they are quite cozy little cocoons. The only downside is that they are not as weatherproof as the Scott Polar tents, and occasionally they get destroyed in severe winds / storms. We cook on a propane stove, and we have no need for lights as it’s daylight 24/7, so our minimal electricity needs are easily met by a solar panel + battery system that charges our various radios, satellite phones, laptops, cameras etc. We communicate with McMurdo station daily on a satellite phone, or if we are close enough a handheld VHF radio. We also have a Vietnam-era portable HF radio that we can use as a backup. All in all it’s a pretty comfortable, if not somewhat basic, existence. The countdown is upon us with exactly ten days left in the field. We won’t be returning to civilization the same people we were when we left it. Boots are beginning to fall apart, beards are taking their natural form, and we’ve started tapering down our consumption of fudge stripe cookies. Eating half a box of cookies a day isn’t a habit I want to bring home with me. Despite the cookies, our broken scale says I’ve lost ~10-15 pounds so far. When our helicopter pilot asks what my “flight weight” is, I’m just as curious as he is. I’ve also started to wonder about the tips of my big toes that have had a tingling and numb sensation for over a week. I try to convince myself it’s not permanent. But if it is, it has all been worth it, I would have given the whole toe. I’ve seen some great geology and scrambled up numerous peaks to enjoy arguably the most incredible views planet Earth has to offer, many of which were also first American ascents (John assures me they weren’t but has provided no evidence to discredit my historic ascents). Camp life has also been surprisingly pleasant – although, it did take hours of protest to convince John that we get a day off for Thanksgiving. Even so, somehow on Thanksgiving Thursday I found myself hauling ~100 pounds of rocks hundreds of meters up a peak. Apparently New Zealanders need to appreciate American holidays more. Eventually we were awarded a day of rest and I was eager to make it feel like a true Thanksgiving. I woke up at 11am, lounged around for several hours, made a massive pile of meat including Cornish game hen and top sirloin steak, and we all gathered around to watch Star Wars: Return of the Jedi. In hindsight we never said what we were thankful for. I’ll say that I am especially thankful for all my friends and family that wrote letters and talked to me on the satellite phone while I’ve been in the field, you guys rock. 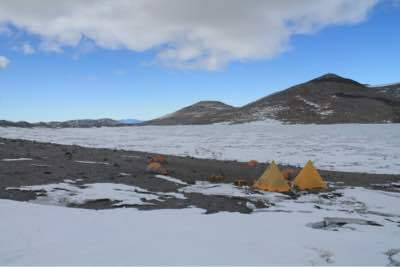 Our final camp is slightly worse than the last: the lake next to it is harder to cross and the bathroom tent isn’t on level ground. 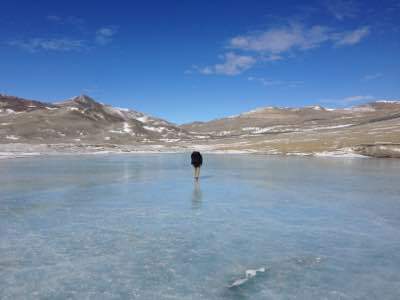 Unsurprisingly, opening a five gallon container of urine on a slant is stressful, and after multiple slips and falls I’ve found that we’ve all become far less eager to cross frozen lakes than we were a couple of weeks ago. The weather has been pleasant and I haven’t put my Big Red jacket on in over two weeks. I’m somewhat worried I won’t have enough bad weather stories to go home with – fingers crossed for a whiteout. 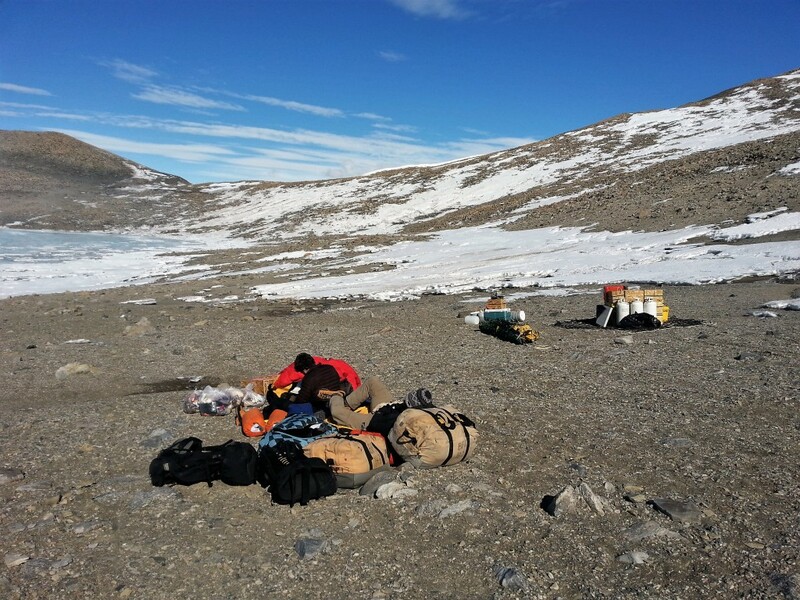 We are almost done with our third camp near Joyce Glacier/Lake Buddha and plan to move to our final camp at Hidden Lake on Monday [editor’s note: sorry, a bit late posting this one]. As it is now Thanksgiving back in the States, it seems appropriate to think about how great the trip has been so far. With the exception of a few very windy days, the weather has been beautiful; we have even had a few days above freezing! 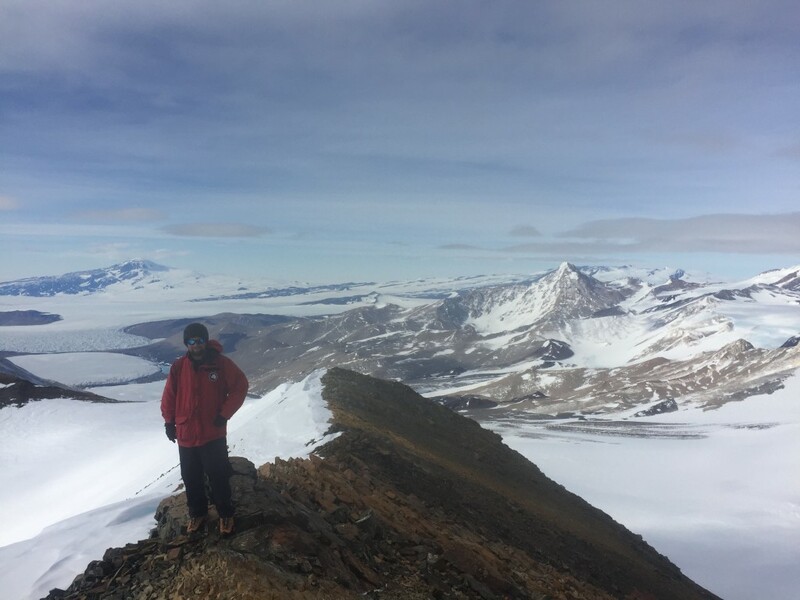 We are currently camped below the Royal Society Range, easily one of the most beautiful mountain ranges I have ever seen; they rise to almost 14,000 feet above the Ross Sea (sea level). 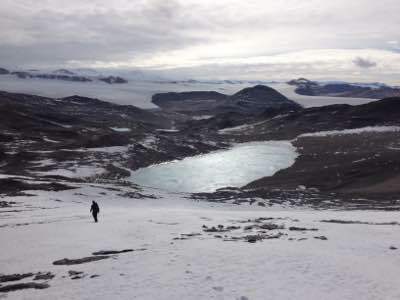 We’ve skated across the pristine ice of frozen lakes, walked on massive glaciers, flown through the Transantarctic Mountains in helicopters, had abundant tea and food that is better than I ever could have hoped for while camping in Antarctica, and have collected over 400 samples. Despite how well things have gone, we are dependent on lots of warm clothing, propane, and helicopter re-supplies. 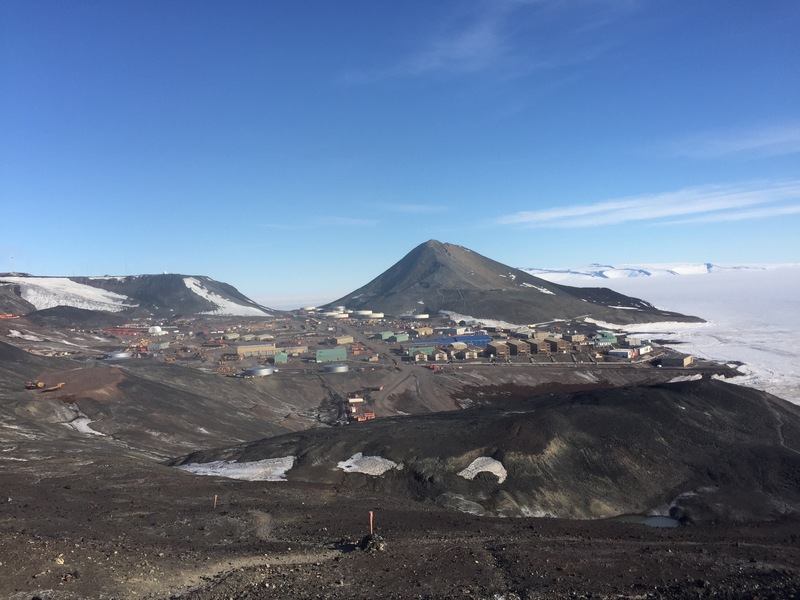 Life on land in Antarctica is about as harsh as it gets. As a testament to this, we have seen only 3 different kinds of lichen and 1 moss in the month that we have been here (and we have gone many days without seeing either). We have not seen any animals. 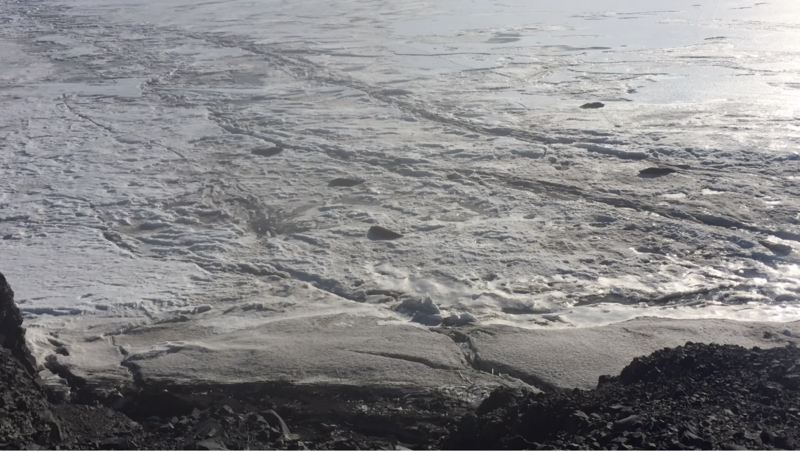 As we get further into summer, seals, penguins, and orcas will become more common sights in the sea around Ross Island, but life on the mainland will not change much. The absolute strangest thing we have seen has to be the mummified seals. 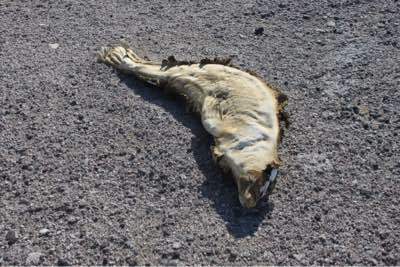 Over the last several weeks we have seen several dozen mummified seals, dozens of miles from the sea. 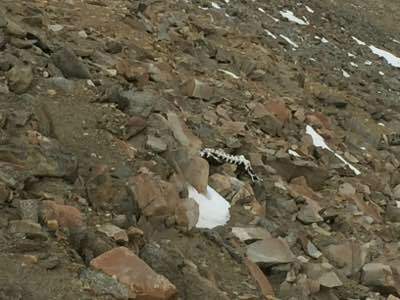 On the steep, boulder-strewn talus slope above our current camp, we found about fifteen, over two thousand feet above sea level. It is thought that these seals are mainly young seals that become disoriented when they surface through the ice shelf in poor weather. The result is that they wonder until they starve/freeze, occasionally far inland and thousands of feet above sea level. 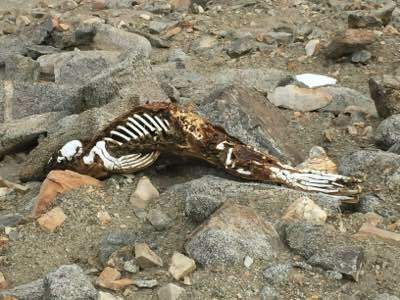 Because of the dry, cold air and lack of scavengers, seals that die on land are preserved until the harsh weather literally breaks them apart. Sometimes we see them from afar and sometimes we stumble on them unexpectedly behind boulders, around corners, or in small depressions. Even having seen so many, each new one we stumble across is a surprise that immediately distracts us from our thoughts. 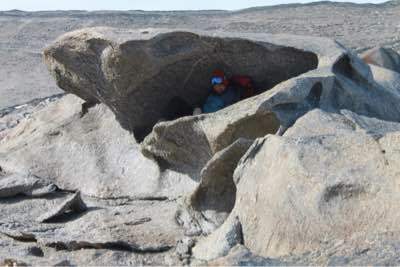 We are not allowed to touch them, because they provide an extremely rare source of nutrients for the microcommunities in the area, but hopefully some of our pictures can convey this eerie feature of our experience. Early last week we shifted our camp about 30 miles south from the Taylor Valley to the Joyce Glacier area. Our new home is tucked behind a steep ridge, sheltering us from all but the strongest winds and making life generally more pleasant. 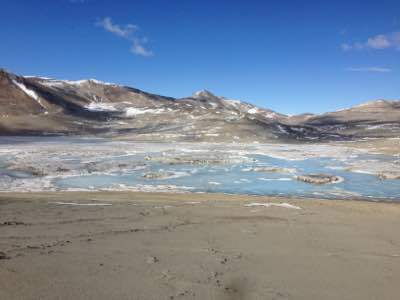 We are camped on what passes for a beach by Antarctic standards, except that our lake-front view is frozen and made entirely of blue-ice (we named our camp Buddha beach after the large lake a few miles to our north). 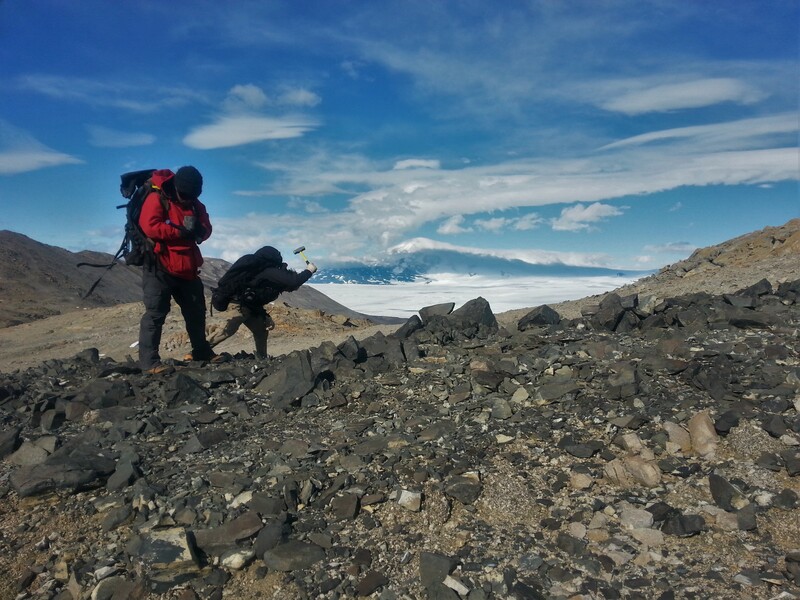 We’ve been hiking as far as we can each day to map and collect samples, and although our target samples, are rarer here, we’ve learnt a lot, and also managed to make ascents of most of the surrounding peaks (all of which Demian has claimed are first American ascents). 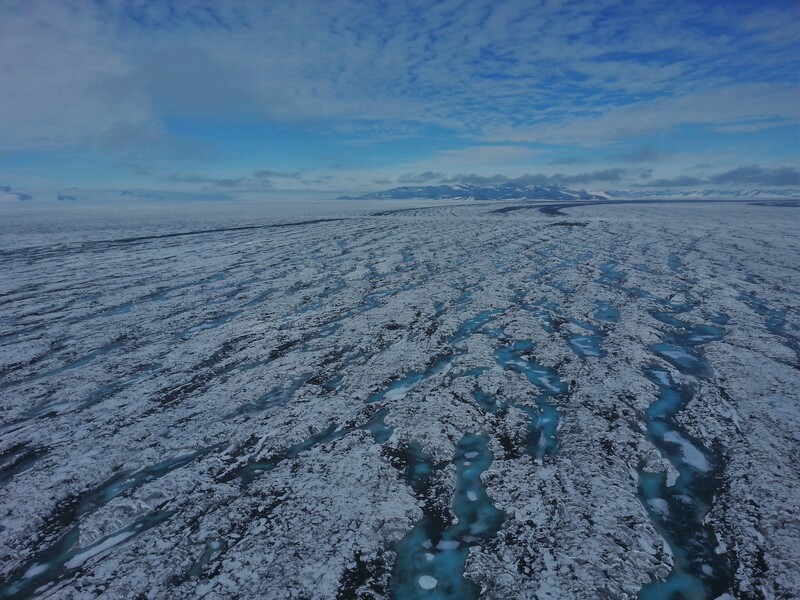 In a change to our daily routine, last Wednesday we were picked up by helicopter and headed north to sample some outlying locations. 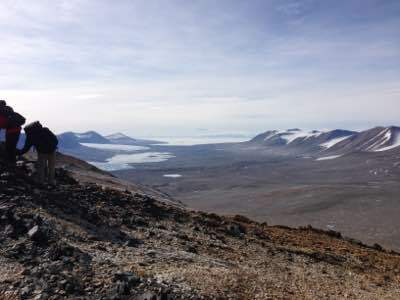 After 6 hours the helicopter returned and collected us, and our now substantially heavier backpacks,with us having spent the intervening time sampling everything within walking distance. 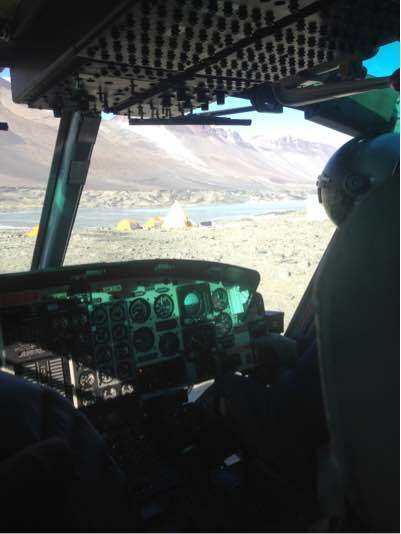 Once again, we all feel very privileged to have experienced one of the most exciting parts of doing science in Antarctica – geology by helicopter! As I sit writing this, we are all safely back at camp relaxing and eagerly anticipating Rob’s dinner creation of chicken-sausage-hash brown-vegetable stir-fry, followed by (canned) fruit de-jour. Tomorrow is thanksgiving (which I’ll let Demian describe in detail in a later post) then we’ll shift to our final camp on Monday, and we’ll be on the home (2 week) stretch. Enjoy thanksgiving wherever you are! We’re certainly looking forward to a couple of days of rest and good food. ~John for the Antarctica360 team. 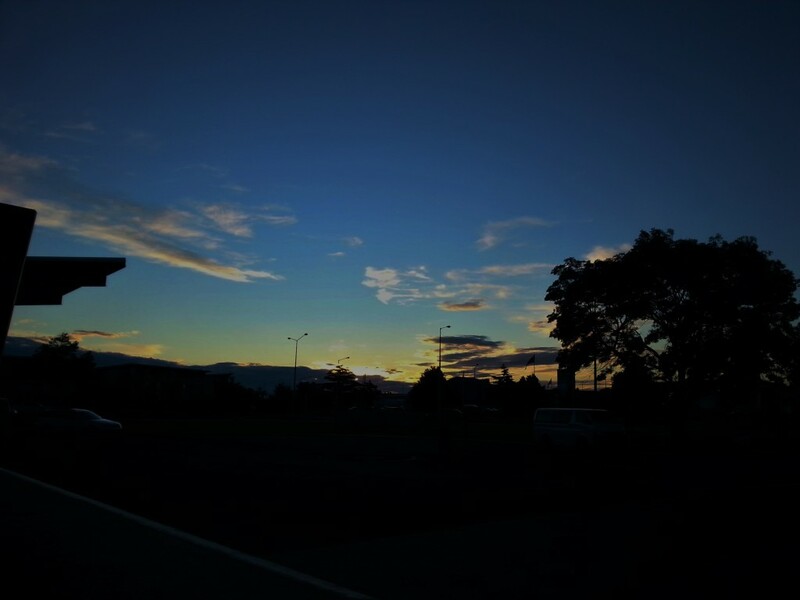 7.30am – wake up. Think about getting out of cozy warm sleeping bag. Look at temperature outside (-15C today) then delay for 10 – 20 minutes (depending on temperature) while contemplating what fieldwork in Hawaii might be like. 7.40am – get out of sleeping bag and dress in 5 – 7 layers of clothing, depending on how loud the wind is howling outside. 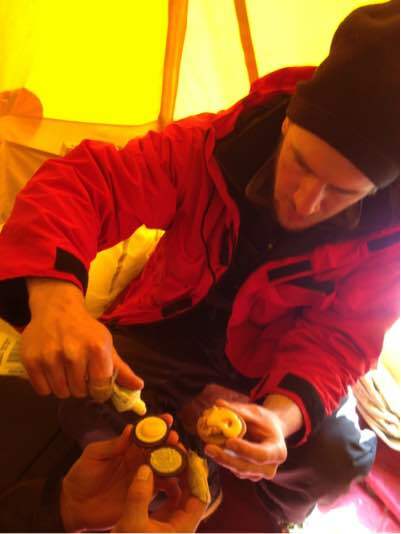 7.50am – run to cook tent (empty pee bottle into barrel on the way), turn on stove, melt ice for hot drinks/breakfast. Further contemplate advantages of tropical field areas. 8.15am – eat 3 bowls of cereal with hot milk, two pieces of butter-fried bread, drink 3 cups of tea with extra milk powder and sugar. 9am – pack bag for the day. Do not forget chocolate, candy, cookies, cheese and salami, spare clothes, radio and extra socks. Brush teeth and apply sunscreen. 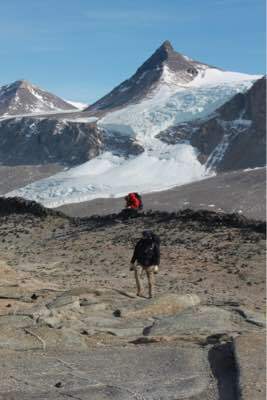 9am – 6pm – walk as far from camp as possible, collect samples, map, make notes and take photos. 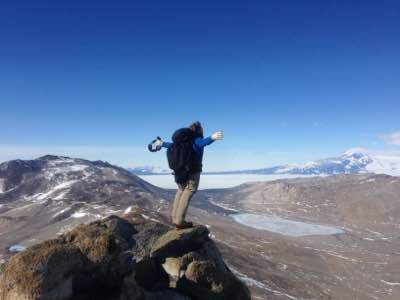 Enjoy the indescribable experience that is wandering amongst the mountains and glaciers of Antarctica. Return to camp when pack is full of rocks (~80lbs) and all snacks have been consumed. 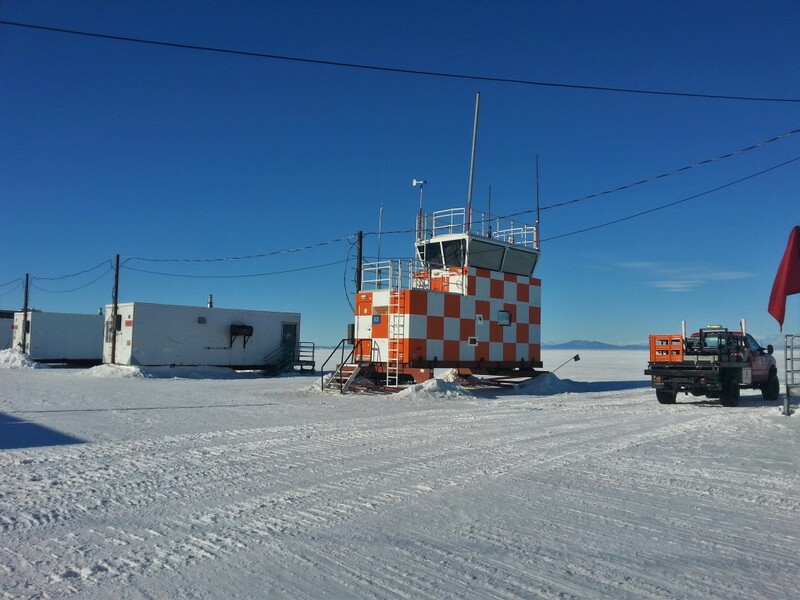 6pm – return to camp, melt ice for drinks, drink several cups of soup, eat crackers/chips/anything in easy reach. One person prepares dinner (tonight is vegetarian peanut satay with rice noodles). 9 – 10.30pm. Drink more tea, eat more cookies (tonight was an entire bowl of cookie dough), fill a water bottle with boiling water for inside sleeping bag, brush teeth and off to bed. Contemplate another day in paradise tomorrow.